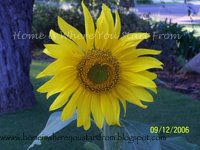 The Great Sun flower project- ~join the hunt for bees! I just found this today, and we will be participating..it looks very easy to set up, I like easy.. :) So, how 'bout you, care to join us? I'm liking this table over at Design Sponge...I'm bugging Sky to make us a new dining table, actually I'm thinking of old barn wood top..but I like the foundation of this table very much. The Casual Blogger Conference, I'm going!! This will be my very first blog conference, if you are thinking about it, even a tiny bit, click over and then look at the schedule...it will convince you. Early bird discount ends today, hurry!